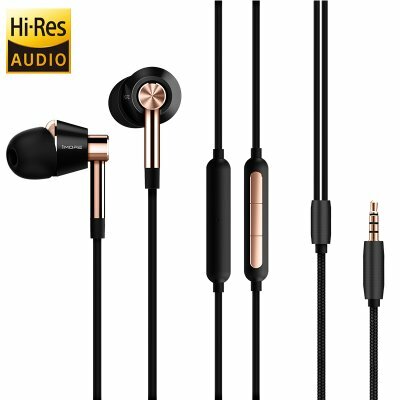 Successfully Added In-Ear Headphones 1More - Triple Drivers, Built-In Mic, 99dB, Aluminum Body, Kevlar Cable, Gift Box to your Shopping Cart. These in-ear headphones from 1More are the ultimate gift for all music lovers out there. Coming with a beautiful gift box, these triple driver earphones leave a great impression from the first time you lay eyes on them. With its a top-notch leather case, 8 different size ear buds, and an airplane adapter – this earphone gift box holds everything an audio fanatic can wish for. The earphones themselves have been crafted out of a high-end aluminum alloy and feature a Kevlar covered cable – giving them a high-end touch and feel that is sure to impress. With these beautiful in-ear earphones, you’ll be able to listen to all your favorite tracks in style. Thanks to its triple drivers, these earphones from 1More are capable of delivering Hi-Res audiophile grade music quality in its purest forms. Never before have you been able to enjoy your songs and experience all sounds in so much detail. With these in-ear earphones at your side, you’ll lift your audio experience to entirely new heights. Capable of producing up to 99dB, these headphones let you blast all those tracks away to listen to them without being bothered by outside noises. Simply slide on the ear buds that fit you best, select your favorite tracks, and you’ll be all set to enjoy a day filled with songs and entertainment. Within its Kevlar covered cable, these headphones hold an easy to operate 3 buttons remote that lets you effortlessly switch in between songs. It furthermore packs a built-in microphone thanks to which you’ll be able to engage in hands-free phone calls no matter where you’re at. For those of you that are looking for a great and stylish accessory that lets you listen to all those classics in stunning audio quality – these in-ear headphones from 1More are the ultimate choice. These In-Ear Headphones comes with a 12 months warranty, brought to you by the leader in electronic devices as well as wholesale electronic gadgets..